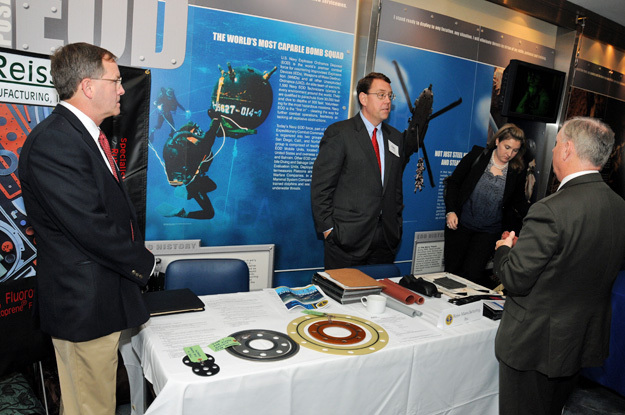 November 4, 2011, Washington, DC – Carl Reiss (center) discusses Reiss Manufacturing capabilities in silicone-based materials and products with Seán F. Crean, RADM, SC, USN, Director, Office of Small Business Programs, Department of the Navy, at the inaugural meeting of the American Shipbuilding Suppliers Association. The ASSA, founded by Carl Fisher, was established exclusively to represent the interests and issues relating to maritime suppliers. Visit www.shipbuildingsuppliers.org for more information. A long-time supplier to the military, Reiss Manufacturing is excited about the opportunity to learn how it may better serve the needs of the U.S. Navy and the men and women of the Armed Forces.